Born and raised in Boston, Massachusetts, Leah has been dancing since she was 3 years old and has never looked back. Leah is known for her positive energy, making class a comfortable environment for all, and her ability to challenge you to be a better dancer. Leah has concurrently run seven performance teams, including student level up to professional. She has taught and performed in many local and out-of-state events including California, Ohio, Florida, Philadelphia, Texas and all over the New England area. Leah has trained in multiple dance styles but today focuses primarily on Latin dances. Jenna & Luis are Latin dance instructors, choreographers, directors, and performers. Jenna, a Malden middle school teacher, combines her passion for teaching with her passion for dance to create a contagious desire to learn and grow. Her most recent accomplishment was winning 1st Place with her Salsa team, Mambo Revelation, at the World Salsa Summit in Miami last February. Jenna & Luis direct Boston’s largest Bachata team, Boston Touch, which is a part of the Island Touch Dance Academy Franchise. In addition to their weekly studio classes, they can be found traveling across the country to teach and perform at various congresses, organizations, and universities. Luis moved to Boston from Puerto Rico and has continued his success in dance. In addition to Latin dance, he is also a trained Hip-Hop dancer and choreographer. He has performed at a large variety of events including the Olympic Games of 2010 in Mayaguez, Puerto Rico, with artists like Olga Tañon, Wisin y Yandel, Tito el Bambino and Ana Isabel. He has also choreographed and performed in music videos with international artists Jowell y Randy and J-Alvarez. "Wow! How did he do that?" Just one of the many reactions that lead to naming Jean Guitho Paul, better known as Ceijay, as the Kizomba King! Born February 5th, 1984 in Haiti, Ceijay moved to the U.S in 2000 to continue his education and fulfill his dreams. 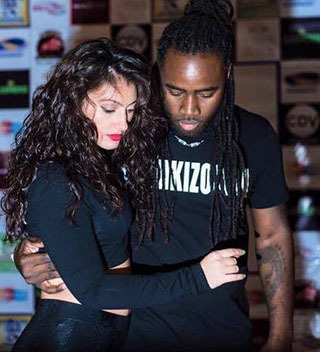 The king of Kizomba began dancing at age 12 and became passionate about kizomba by age 20. Going on his fifth year as an instructor, his style is unique and his advanced moves allow the city of Boston to move comfortably to the sensual beats of Kizomba. With the goal to have dancing facilities in many communities within the north and south shore of Boston, Ceijay's ambition is the promotion of dance as an art, hobby, physical activity and a means to achieving one’s goals. Join Ceijay Kizomba and see what everyone is talking about!!! !